The structure of our program ensures flexibility in your education, allowing you to cater your education to your career aspirations by taking economics courses, MBA electives or courses from Laurier’s Master in International Public Policy at the Balsillie School of International Affairs. Our co-op option adds valuable professional experience and expands your network in just four or eight months, in addition to your 12 months of coursework. This option will also give you the opportunity to apply the knowledge and skills you acquired in the classroom, to acquire new insights, and to enhance your employment prospects. The Canadian Association for Business Economics, with a membership of over 1,000 professional economists across the country, has enthusiastically endorsed this program, provided advice on the curriculum and confirmed the need for economics graduates with the skills this program develops. Our MABE is a full-time program and is normally completed in 12 months, with an additional four to eight months for those accepted into the co-op option. You must complete the equivalent of nine one-term courses, including six required courses that provide you with advanced knowledge in economic theory, applied economic analysis and quantitative methods. In your final term, you will complete a major research paper related to one or more of your courses or your work term experience. Our faculty are engaged in a wide range of research, including international and development economics, econometrics, financial economics, health economics, industrial organizations economics, labour economics and law and political economy. 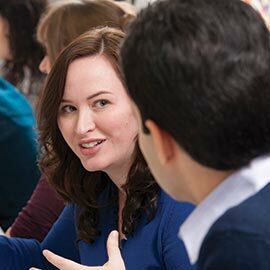 Laurier’s Department of Economics is associated with several research centres, including the Laurier Centre for Economic Research and Policy Analysis, the Centre of International Governance Innovation and the Viessmann European Research Centre. A four-year (honours) undergraduate degree (or equivalent) in economics or a related field. A minimum B average with one course in each of the following: calculus, statistics and econometrics (focusing on regression analysis). Two one-term undergraduate courses in both intermediate microeconomic theory and intermediate macroeconomic theory. Applications are reviewed by the graduate program committee, which considers all prior university grades, a writing sample and letters of reference. Graduates of our program have pursued successful careers in economic policy analysis, economic forecasting, industry and market studies, financial markets and institutions, strategic planning and public policy.